The production of euro banknotes is a combined effort by the national central banks and the ECB. It begins with calculations for the number of banknotes required each year. Enough new banknotes need to be produced to replace unfit banknotes, to meet expected increases in demand – such as seasonal peaks – and to cope with unexpected surges in demand. 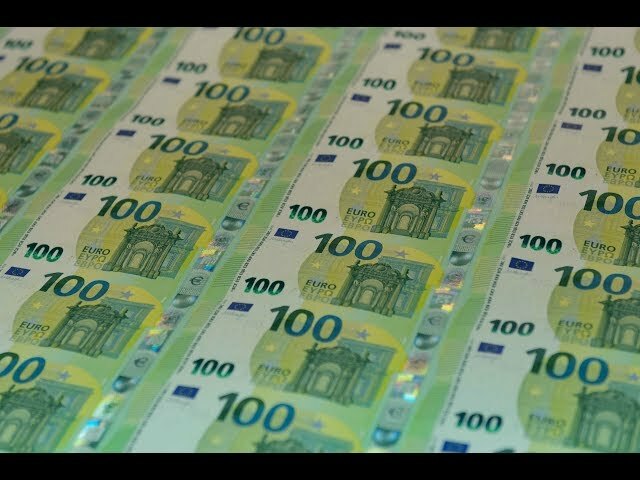 Forecasts of the demand for euro banknotes for the year ahead are provided by the NCBs, and a central forecast is made by the ECB. Under the supervision of the ECB, the NCBs redistribute the banknotes to avoid shortages or surpluses in any one country. In order to produce the banknotes efficiently, printing is shared among the different NCBs. The ECB allocates production volumes to a number of NCBs, which then supply a specific proportion of the total annual production of one or more denominations. The respective bank bears the production costs for the share allocated. For example, the French, German and Italian central banks produced 1.7 billion €50 banknotes in 2017. 11 high-security printing works in Europe produce the banknotes. The notes are subsequently distributed among the different NCBs. This pooling arrangement and a common quality management system ensure a uniform standard for all euro banknotes. Throughout the production process, hundreds of manual and automated tests are performed to ensure that banknote denominations are identical regardless of where they were printed. Just like the first series of euro banknotes, the Europa series of banknotes are printed on pure cotton-fibre paper, which gives them their special crispness and wear resistance. Certain security features, such as watermarks and embedded threads, form part of the paper itself. Different types of plates, special inks and several processes are used: offset and intaglio printing, hot-stamping for the hologram and silk screen printing for the numbers that change colours. optimise banknote transportation between central bank branches. The Strategic Stock is intended for use in exceptional circumstances, i.e. when logistical stocks in the Eurosystem are insufficient to cover an unexpected increase in the demand for banknotes or in the event of a sudden interruption in supply. Both stocks ensure that any changes in demand for banknotes can be handled at any time by the national central banks, irrespective of whether the demand comes from inside or outside the euro area. Do you handle cash as part of your work? See all our information material on euro banknotes.